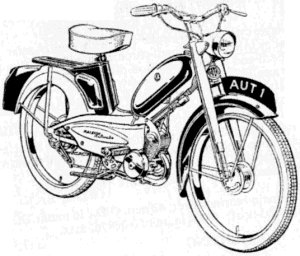 Raleigh's first moped was introduced in 1958 with an engine designed by Vincento Piatti—the designer of Mini-Motor. 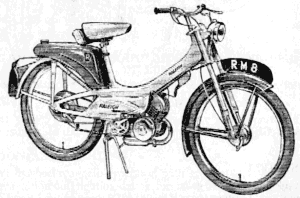 Raleigh became part of the Tube Investments group of companies in 1960; this brought the Raleigh, Norman, Phillips and Hercules brands of moped under the same ownership. The obvious course of action was to rationalise these four ranges into one common series. It was decided to license the Mobylette range of mopeds produced by Motobécane in France. 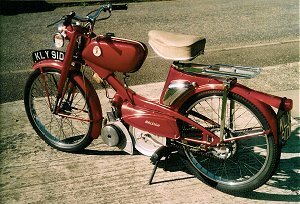 A ‘stop gap’ based on the Sachs-engined Nippy aready being produced by Norman was sold in Ireland until the Mobylette-based models were in production. 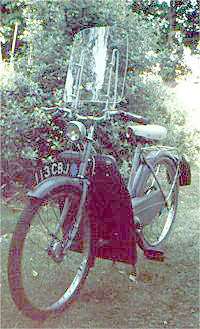 From then on, Raleigh, Phillips and Norman mopeds were effectively re-badged Mobylettes. 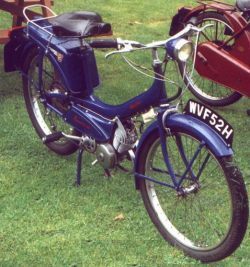 The main exception to this was the Wisp, which, although it used Mobylette running gear, had an in-house frame. This frame was based on Raleigh's RSW16 bicycle and was an attempt to take advantage of the ‘small-wheel’ boom being enjoyed in the cycle industry as a result of the success of the Moulton bicycle. 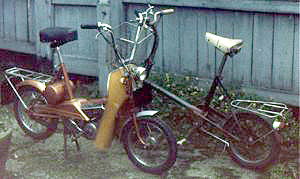 Production of Raleigh mopeds ceased in 1971. As RM1 but with the addition of a manual clutch and coupled brakes. Clutch kit also available to convert RM1 to RM1C. 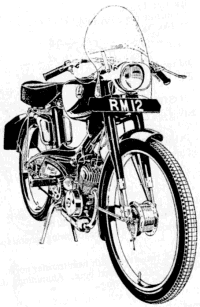 Similar to RM1C but with one gallon fuel tank and lower gear ratio, grey frame, maroon tank and engine covers. 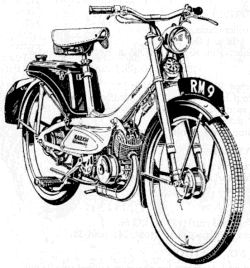 Although Raleigh was working on a development of the RM2 but with automatic transmission, this was halted by the merger of Raleigh into Tube investments. This might have been the RM3. A more likely candidate is the Raleigh Super. 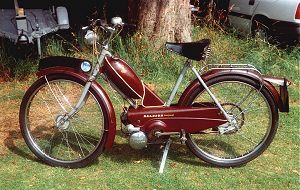 The Super was a Norman Nippy with a Sachs two-speed engine made for Raleigh (Ireland) Ltd to fill the gap between the end of the RM2 and the introduction of the RM4 & RM5. 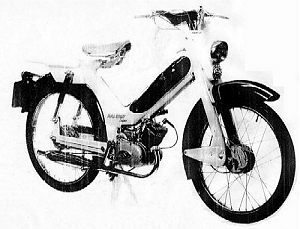 Sachs-engined moped based on the frame pressings used by the Norman Nippy. 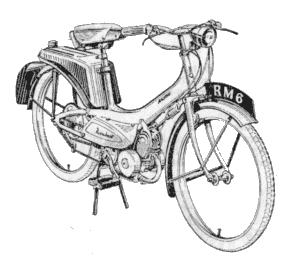 Following the merger of Raleigh and TI, it was decided to produce an entirely new range of mopeds rather than continue any of the existing ranges. Same frame and engine as the Mobylette—built under licence from Motobécane in France. Single-speed, automatic clutch, rigid frame, telescopic front forks, drum brakes. Charcoal Grey & Pearl Grey. Telescopic front forks fitted. Fire Red & Pearl Grey. Raleigh Green & Pearl Grey, or Neptune Blue (single colour). Specification changed to that of the Runabout de Luxe. More powerful engine that the standard RM6. Royal Carmine (single colour). Same as Runabout de Luxe but with legshields fitted as standard equipment. Royal Carmine (single colour). Cheaper version of Runabout—finished in black. Charcoal Grey & Pearl Grey, or Royal Blue & Pearl Grey. Royal Blue & Pearl Grey. Calypso Coffee & Pearl Grey (offered for a few months only), or Royal Carmine (single colour). Same as the Ultramatic but with dual-seat, pillion foot rests and stronger rear wheel. Golden Sand. Touring moped—similar to Supermatic, rigid frame, telescopic forks, motor cycle style fuel tank. Royal Carmine. 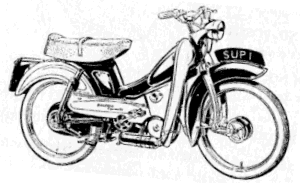 Sports moped—similar to Supermatic, rigid frame, telescopic forks, motor cycle style fuel tank. Black & Neptune Blue. Pearl Grey with Fire Red trim.